Many homeowners use the garage for more than simply parking cars. It often houses the water heater, an extra refrigerator or freezer, a garage door opener and sometimes even an entire workshop. The circuitry required by these functions plus the lights makes installing a garage subpanel a sensible thing to do. When planning a subpanel installation, you have to take two things into account. One is the size of the panel, which includes its actual capacity for circuit breakers as well as its current rating. The other consideration is the distance of the subpanel from the main panel, which determines the size of the cable you use to connect them. 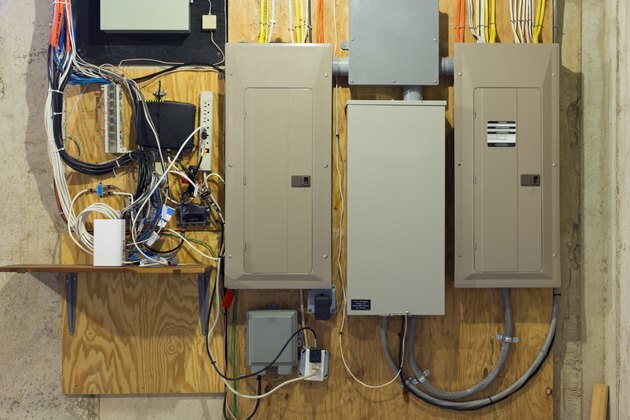 The subpanel can be inside the garage or on an exterior wall. If you choose to mount it outside, you need a waterproof panel enclosure rated for exterior use. As you're planning your subpanel installation, you need to determine the expected load. The National Electrical Code publishes a calculation form for this purpose. Filling it out is a little like doing your taxes. The basic gist of the procedure is to measure the square footage of the area served by the subpanel and multiply by 3 watts to cover lighting. Add to this a minimum of two 1,500-watt appliance circuits (more if needed) and the power draw in watts of each large appliance permanently wired to the panel. You can get this information from the label affixed to each appliance. Add up the total power draw and divide by 240 volts. Round up the result in amps of current to the nearest breaker size. For example, if the result is 42 amps, you need a 50-amp breaker in the main panel to serve the subpanel, and you need to purchase a panel rated for that amount of current. If in doubt, consult the NEC's load calculation form or ask an electrician. The subpanel connects to the house electrical wiring via a double-pole breaker in the main panel, and you choose this breaker according to the current draw as described above. The wire gauge of the cable you use to connect the subpanel to the main panel depends on the size of this breaker as well as the distance between the panels. In general, you need 10-gauge wire for a 30-amp subpanel, 8-gauge for a 40-amp one and 6-gauge for a 50-amp subpanel. If you need a 100-amp subpanel, you'll be running beefy 3- or 4-gauge cable with a 6-gauge ground wire. Voltage drop becomes an issue over distances in excess of 100 to 150 feet depending on cable size. If you have to run cable for a longer distance, it's recommended to upgrade to the next wire gauge. You can direct-run UF cable in a 24-inch-deep trench, but the cable must pass through a vertical PVC conduit that extends at least 18 inches into the ground on either end. The conduit must have waterproof connections to the walls through which they pass or to the panels themselves. The metal panel enclosure can be installed on any stable vertical surface as long as there is a minimum clearance of 3 feet in front and on either side. The panel must be easily accessible, so it shouldn't be much more than about 5 feet above the ground. The double-pole breaker that controls the subpanel occupies two adjacent slots in the main panel. If the panel is overloaded, you may have to move breakers around to make space. Circuit breaker wiring isn't complicated, but it can be hazardous. It's best to hire an electrician for this part of the panel installation.